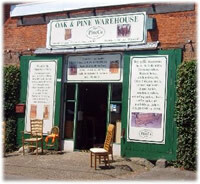 The oak and pine warehouse is a family run business, which has 46 years combined experience in the furniture industry. Originally we started in the antique's trade as furniture restorers and cabinetmakers but we slowly progressed into the general domestic furniture market in the late eighties specialising in pine furniture. But we have never lost touch with our roots as cabinetmakers, and now days we apply our knowledge of furniture design and manufacture and finishing to our bespoke furniture workshop. We also apply this knowledge to our designs which we have made solely for us in the UK and Europe, where we oversee manufacture of our designs to the standard we feel is required by you the customer. Each year we are commissioned to make for client's appx 450 pieces of bespoke furniture. Which we make in house in the UK. Nowadays we offer a vast choice of furniture, which we carefully select on a quality basis, if we won't have it in our home we don't think it is worthy of yours. We are also committed to reducing our impact on the environment, by using as much as possible products, which are made from timber from sustainable sources . also we try and source as little as we can from the far east due to the high carbon footprint these products have. We also recycle as much of our packaging as possible and use environmentally friendly products as much as we can. You can view and buy through our showrooms, or from the comfort of your own home using our Website.